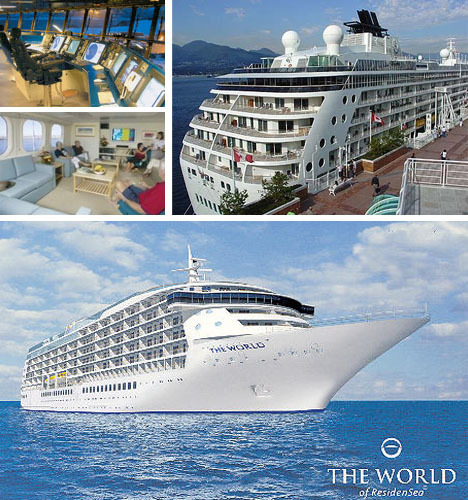 The World Cruise ship is considered to be the world’s largest private yacht. It is a floating residential neighbourhood owned by its residents which are currently from 40 various countries. They live on board and sail circumnavigating the world. 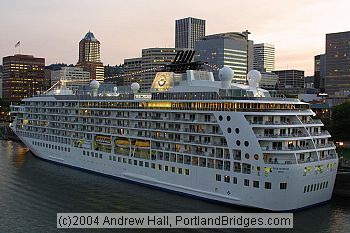 The World Cruise Ship stays in ports from 2 to 5 days. There are people that stay onboard full time others stop-over at their sea residence at regular intervals throughout the year. The World is the brainchild of Knut U. Kloster Jr. His family had been in the cruise ship industry for a long time. It was built in Rissa Norway. On October 2003 people who reside on the World cruise ship are part owners. ResidenSea manages the operation and administration of the entire ship including hiring numerous employees that offer various services like photography housekeeping beauty treatments and other facilitators on board. The ship has various facilities similar to cruise ships. It is a unique vessel as it is people’s homes. The world cruise ship has a small grocery store a boutique delicatessen complete athletic facilities casino golf simulator putting green jogging track full sized tennis court and a gym. The entertainment is also plentiful there is a library theatre and music performances. With addition to land excursions there are also classes offered on board in language dance cooking navigation arts and crafts computers music and photography. It also has a high speed internet access in all residences. The ship has a private yacht club atmosphere. It is rated as a five-star luxury ship. It made its maiden voyage in May 2002. With comparison to other cruise lines they are very focused on a slower more relaxed lifestyle together with the ultimate luxuries. In the state of the art suites they can accommodate up to 12 persons. It is the only ship in its kind combining the privacy and indulgence of conventional luxury resorts with the perfect experience of travelling by sea. It has 130 fully furnished residences with 30 guest studies with 55 000 sq. ft of luxurious public spaces and is the main reason why it was rated with 5 stars. Guests are also very welcome. With the World Cruise Ship there is no obligatory cocktail parties no long lines to board launches/buses no organized shuffleboard tournaments no rushing from port to port and no regimented dining schedule. Upon boarding the ship time will literally be non existent. It sails in the most leisurely fashion. It has lavish fitness centres and spas by The Banyan tree firm. It is the only ship that has a full sized tennis court on the ocean internet cafes casinos chapels heated swimming pools aquatic marina pursuits and seven eateries tons of books and DVD libraries deli four bars. The crew to passenger ratio is 2:1 giving the vessel a very exceptional service that can guarantee to beat the best in the world. Good information and extremely enlightening. Thanks for taking the time to write it and post it! My brother suggested I may like this blog. He was entirely right. This put up truly made my day. You cann’t imagine just how much time I had spent for this info! Thank you! Thanks and Please keep updating your Blog. I will be stopping by every time you do . You’ve observed very interesting points ! ps decent internet web site . You can do a site like this from WordPress for free. They also give you guidance about how to present information. Just look for their website. Have thought about this and do have a Facebook page. I feel that perhaps I should keep this separate for now. olje Nice post, thanks. Do you have a Twitter account? Although a ‘bird’ unfortunately I don’t tweet. bmw olje Nice post, thank you. Do you have a Twitter account? I’m glad to be considered one of quite a few site visitors on this excellent internet page (:, thanks for putting up. I wanna be there…This is my yearning dream..